Rouhani’s execution toll ahead of Washington Summit should worry everyone! Four young prisoners were executed on the morning of September 16 in Qir and Karzain (Ghirokarzin) County. Their families have gathered outside the governorate for the fourth day. These prisoners were held in Fars Province, Iran and hanged there. Another report also suggests that they formed a strong protest at the Revolutionary Court and attacked it. This court in Qir and Karzain was responsible for the hangings. Hojat Eeghtesadi, who had been detained by Police on September 11 in Malekan City was killed. Hojat had been taken to the police station in Bonab, East Azerbaijan, where he was beaten to death. Iranian communities such as this one in Canada has called for a rally against Rouhani. 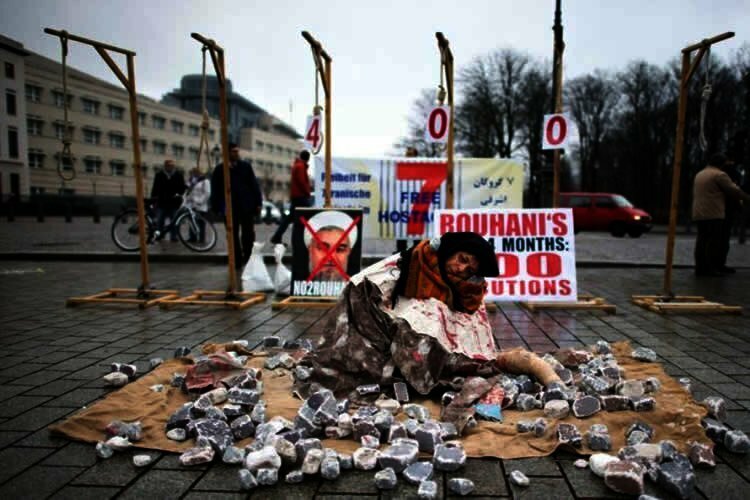 They are amongst Iranians seeking regime change and hold government keys responsible for death rates. Rouhani’s execution toll is monitored by opposing organizations and has been raised with the UN ahead of the Washington Summit. #FreeIran2018 Rally: Sept 25th NYC. Former UN High Commissioner for Human Rights, Zeid Ra’ad al-Hussein had stated in February that Iran violates the absolute prohibition under international human rights law far more often than any other state about executing juveniles. The latest of which at that time was Mahboubeh Mofidi who killed her husband when 16.